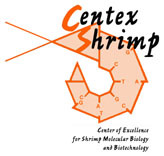 Centex Shrimp, which is an abbreviation for the Center for Excellence for Shrimp Molecular Biology and Biotechnology. 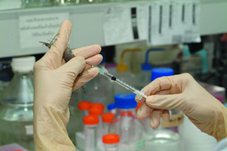 It is a multidisciplinary laboratory that was formed in October 2001 by the amalgamation of research laboratories from the Departments of Anatomy, Biochemistry and Biotechnology of the Faculty of Science and It is jointly supported by the Faculty of Science, Mahidol University and the National Center for Genetic Engineering and Biotechnology (BIOTEC). Thailand will be the world leader in production of healthy & healthful, domesticated shrimp cultivated in biosecure pons with no negative environmental impact. This could be summarized by the motto, “Premium shrimp from paradise”. The mission statement for Centex Shrimp is "Premier science for premium shrimp". 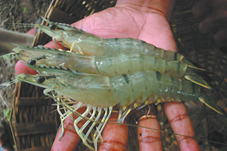 This means that its aim is to carry out academically excellent research on molecular biology and biotechnology of shrimp for application in the production of the highest quality of consumer shrimp. 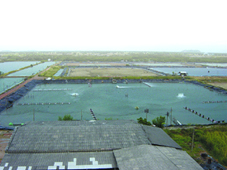 "Premier Science for Premium Shrimp"
Centex research projects are driven by a combination of current needs of the shrimp industry and expertise of the staff. Research priorities are set by urgency of industry needs, and these can change with time. Thus, the interests listed below reflect the situation at the time this webpage was printed. Development of DNA diagnostic procedures for several viral diseases: White-Spot Syndrome Virus (WSSV), Yellow-Head Virus (YHV) and Hepatopancreatic Parvo Virus (HPV) in shrimp. These are now available together with reagents for all these viruses from the Shrimp Biotechnology Business Unit (SBBU) under the Ezee Gene brand. Development of nested RT-PCR diagnostic detection for yellow head virus that is now licensed to Farming IntelliGene Technology Corporation, Taiwan. Science and Technology Award in 2000, Thailand Toray Science Foundation, in recognition of the group’s work on shrimp viral disease diagnosis and control. (Prof. Dr. Vichai Boonsaeng, Prof. Dr. Timothy W. Flegel and Prof. Dr. Boonsirm Withyachumnarnkul). Outstanding Technologist Award in 2003, Foundation for Promotion of Science and Technology under the patronage of His Majestry the King, Applications of Biotechnology for Shrimp Industry (Prof.Dr. Vichai Boonsaeng, Prof. Dr. Timothy W. Flegel and Prof. Dr. Boonsirm Withyachumnarnkul in collaboration with researchers from other departments of Mahidol Univesrsity, Chulalongkorn University and Srinakharinwirot University. Centex Shrimp is operated by funds from six sources: Mahidol University, BIOTEC, research grants, contract research, royalties on intellectual property (IP) and revenue from training and analytical services. In the 2001-2002 fiscal year, total input from Mahidol University was approximately 15.4 million baht (excluding faculty salaries and overhead) and grant funding was approximately 7.7 million baht, for a total of approximately 23.1 million baht (about US$500,000). Approximately half of this amount was in the form of capital expenditures of start-up equipment and this will be repeated for the second and third years of operation. Thereafter, capital expenditures will decrease substantially, but it is expected that grant income will increase with the increasing size of the group. With respect to income from services and IP, Centex Shrimp collaborates closely with the Shrimp Biotechnology Business Unit (SBBU), established by BIOTEC to bring the results research to the marketplace. For example, SBBU currently markets PCR test kits under the Ezee Gene brand for a number of shrimp pathogens, including white spot syndrome virus (WSSV) and hepatopancreatic parvovirus (HPV). It also markets a monoclounal antibody kit for yellow head virus that resulted from research within Centex Shrimp through collaboration with other institutions.